RA Causes: What are the Top Causes of Rheumatoid Arthritis? The specific causes of rheumatoid arthritis (RA as it’s often shortened to in the medical community) have yet to be identified. This is true despite decades of medical research. However, while we don’t know specifically what brings about RA and the symptoms it is known to create — such as joint pain, stiffness, fatigue, and low-grade fever — we do know that it is the result of an autoimmune disorder which ultimately affects the joints. In fact, oftentimes the pain in the joints is so severe that the people suffering from RA are advised to take a nonsteroidal anti-inflammatory drug (NSAID) such as aspirin, ibuprofen, or naproxen or some other type of anti-rheumatic drug to help ease the pain in the joints created by RA. What’s the connection between RA and the joints? Specifically, how does this disease impact the joints in the human body, creating pain as a primary symptom? The answer to this question begins first with understanding that RA is an autoimmune disorder. This means that this particular disorder occurs when immune cells begin to attack the normal cells of the body. In the case of RA specifically, the body attacks its own healthy joint tissue called the synovial membrane, or synovium. If you’re unfamiliar with the synovium, don’t worry. You’re not alone. The synovium is the lining of the joint which produces a clear liquid substance known as synovial fluid. This fluid has two roles. First, it is responsible for lubricating healthy joints. Second, it gives cartilage and bones the nourishment required to remain effective and mobile. Once RA has been triggered, antibodies are produced and they go into attack mode. These antibodies release chemicals that cause inflammation to the synovium, inhibiting its ability to produce the synovial fluid. As less and less fluid is produced, the joints become more stiff and immobile. This is generally where NSAIDs often come in, to help treat the pain that results. 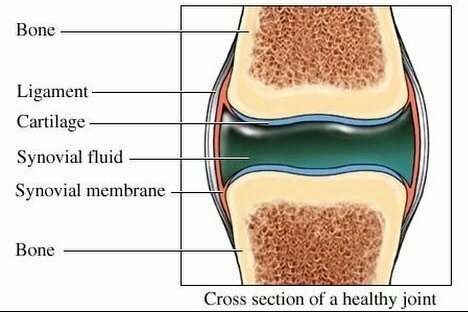 As the synovium becomes thicker without the benefit of the fluid’s normal, healthy lubrication, the joint’s cartilage can also become destroyed, causing inflammation. Over time, this can weaken and eventually destroy the connective tissue between the bones. Once the cartilage is destroyed, the ligaments that connect to the bone also begin to weaken. The tendons that connect the bone to muscle are negatively impacted as well. As the ligaments and tendons weaken, they can no longer hold joints in proper position; they’ve essentially been stretched out, which can cause such a severe loss of configuration that the joint can eventually be totally destroyed. This entire process is what leads to the chronic RA symptoms which people with this disease suffer from. It’s also why anti-inflammatory medications on several levels are effective RA treatment. If the RA is chronic in nature, which means that it is a severe inflammation and goes on for quite some time, one could also develop rheumatoid vasculitis. Rheumatoid vasculitis is an inflammation of the blood vessels. Fortunately, this condition only afflicts about one percent of RA patients as a whole. It is thought to be brought on by a compromised immune system, ultimately making it more able to attack the blood vessels in addition to the joints. Another somewhat rare form of RA is called palindromic rheumatism. In the case of palindromic rheumatism, instead of the pain and stiffness in the joints being constant, it is more flippant in nature. In other words, between attacks, the joints go back to normal with no permanent damage. While the symptoms may be less problematic than with other forms of arthritis, palindromic rheumatism can lead into the development of RA. That makes finding a quick treatment option extremely preferable so that this type of come-and-go inflammatory arthritis doesn’t result in joint damage that is more permanent in nature. Medical professionals can often get a decent read on how severe a patient’s current RA flare-up is by testing his or her level of c-reactive protein (CRP). CRP is a protein in your blood which rises in response to inflammation and infection, making it a solid indicator of how much inflammation is currently present in the body. A simple blood test is all it takes to see where a patient’s levels are. Even though the exact causes of RA are unknown, researchers have identified that it is the result of an autoimmune disorder which creates joint inflammation, pain, stiffness, and other common RA symptoms. Today, researchers continue to study what triggers the disorder and its symptoms as well as the different factors that induce RA. It is suspected that autoimmune diseases like RA are caused by a multitude of variables. These can generally be broken down into four basic categories: genetics, hormonal changes, lifestyle choices, and environmental factors. Sometimes it is a combination of them all as, while they each have the ability to impact the health of your joints, put them together, and they can really wreak havoc. While having a specific history of RA in your family can increase the chances of your own development of the disease, this does not always guarantee that you will develop this type of inflammation. The degree of risk as it relates to genes, that are passed down from one generation to the next, can vary quite greatly when it comes to determining what role family history plays in developing the disease. What does this mean in easy-to-understand terms? Put simply, people who possess a genetic background of RA may never develop this disease and thus require treatment. Conversely, some people develop RA without any known family history, causing them to wonder where all of the pain and stiffness is coming from and, perhaps more importantly, how to treat it as quickly and effectively as possible. Juvenile rheumatoid arthritis (JRA), also commonly referred to as juvenile idiopathic arthritis (JIA), is a good example of how genetics can play a role in the development of a disease such as this. Those from European ancestry are most at risk of inflammation associated with JRA or JIA, while African Americans also tend to test positive for rheumatoid factor more often than some of the other racial groups. Rheumatoid factor is an antibody which, in higher levels, can indicate that someone is at a higher risk of the development of a rheumatoid nodule or other rheumatoid disease which results in joint damage. It has also been determined that there isn’t one individual gene that causes the joint pain and inflammation associated with RA. Rather, researchers feel that there is a combination of genes interacting with each other that potentially lead to development of the disease. This genetic combination can cause the development of RA early on in life, as in the case of JRA, as opposed to some of the potential environmental causes that may lead to its development as a person advances in years. Another way that genetics may potentially play a role in the potential development of RA is when a person has another genetic condition that weakens his or her immune system. If you have been genetically predisposed to conditions like Epstein-barr virus or Sjogren’s syndrome for instance, you could be more susceptible to viral or bacterial infections. Furthermore, it’s possible that this susceptibility could trigger the development of other autoimmune diseases such as RA. Thus, treatment of those conditions can potentially help reduce one’s risk of RA. It does this by making your immune system stronger and more capable of preventing other autoimmune diseases. If there’s a question about whether genetics is an issue for you, a blood test may help provide the answer. Research has shown that there are a greater number of women who develop RA in their joints, with three times as many patients being female versus male. This leads researchers to believe that female hormones could contribute to the triggering of this disease, making them a risk factor worth considering. Women who develop RA typically do so somewhere between the ages of 30 and 60 years old. That puts this age range specifically at risk for developing the symptoms associated with RA, the pain and the stiffness in the joints, leading them in search of effective treatment methods in higher numbers than other segments of the population. Because of this, it appears that maintaining healthy levels of the reproductive hormones, estrogen and progesterone, can reduce the risk of triggering RA inflammation. That makes doing blood tests and addressing these levels a prospective treatment option for patients with RA as joint symptoms are reduced during pregnancy as well as during a woman’s postovulatory stage of the menstrual cycle, when reproductive hormone levels tend to be higher. These types of hormonal changes also put a woman at risk as she ages, when her levels of reproductive hormones naturally decrease. Once she has reached and passed the age of menopause, hormone levels aren’t nearly at the same as they were at an earlier age. It is possible that this lowered hormone level is what causes the onset of this type of arthritis in the joints, and is why this segment of the population experiences this disease more than any others. As for non-genetic risk factors, researchers consider the possibility that obesity, smoking, and poor health in general could be potential contributing factors in developing the pain and stiffness commonly felt by patients with RA. This only makes sense as all of these lifestyle factors are known to compromise an otherwise healthy immune system, making it easier for joint-related conditions like RA to take hold. Case in point: Research has shown that many patients suffering from RA are diagnosed with obesity prior to developing the disease. This link could be explained by the fact that fat cells store cytokines, which are inflammatory chemicals. The more fat cells you have, the more inflammatory chemicals your body stores. Smoking, like obesity, also puts you at greater risk for many health conditions, with RA being one. Smoking cigarettes can have serious adverse effects on the ability of your immune system to function properly. The damage that inhaling all of these carcinogens does to the body, combined with other genetic factors, could increase your risk of developing RA. Although no evidence can directly link RA to obesity, smoking, and overall bad health, these are still prominent risk factors and should be controlled as preventative measures when it comes to achieving and maintaining healthy joints. The best thing about them is that they’re all controllable on a personal level, making them an affordable and simple-to-implement treatment option that doesn’t require going to a health professional or taking time off work. Making positive lifestyle choices can also reduce RA symptoms. Thus, if you’ve already been diagnosed with this disease, losing weight, quitting smoking, and improving your health can potentially make treatment easier and more effective. Outside of the lifestyle factors of smoking, obesity, and poor health, there are also environmental factors to consider. These include exposure to chemicals and pollutants which could heighten your risk of RA. Found in the form of air pollution, food and product chemicals, second-hand smoke, and insecticides, these toxic substances are all parts of our external environment that are known to have a negative impact on our body. This makes them prime candidates for creating the painful joints suffered by RA patients. Depending on the type and severity of the exposure, it’s possible that these can all be contributing factors to developing autoimmune diseases like RA. As managing your weight and quitting smoking are recommended to lower your RA risk, avoiding exposure to toxins is another way of controlling and preventing the disease. If your environmental exposures are many and you’ve already been diagnosed with RA, successful treatment may involve removing these toxins from your space as much as possible. For instance, if your job entails working around chemicals that could be contributing to your RA, then perhaps a career change is a suitable treatment option. Or, if you live with someone who smokes, making them go outside or ending the relationship may help reduce your RA symptoms. Environmental issues also include any past emotional or physical traumas that alter how the body reacts. These types of issues are also thought to perhaps contribute to the eventual development of RA because emotional stress is shown to activate or trigger an immune response, which in turn worsens the disease and its symptoms. In this case then, certain individuals who have experienced a high level of stress or a trauma and who have a genetic predisposition to RA are at higher risk. Both of these factors individually or in unison could trigger the onset of this disease. Ongoing research continues to further identify the causes of RA in patients, the risk factors, the symptoms — such as severe pain in the joints — that this condition creates, as well as effective treatment options. The goal is the eventual prevention of this painful and debilitating disease and the creation of a better life for people with RA.